However, the documents make clear that it is not only data about foreigners’ communications that are available on the system. Alexander’s memo states that “many millions of…minimized communications metadata records” would be available through ICREACH, a reference to the process of “minimization,” whereby identifying information—such as part of a phone number or email address—is removed so it is not visible to the analyst. NSA documents define minimization as “specific procedures to minimize the acquisition and retention [of] information concerning unconsenting U.S. persons”—making it a near certainty that ICREACH gives analysts access to millions of records about Americans. The “minimized” information can still be retained under NSA rules for up to five years and “unmasked” at any point during that period if it is ever deemed necessary for an investigation. The Brennan Center’s Goitein said it appeared that with ICREACH, the government “drove a truck” through loopholes that allowed it to circumvent restrictions on retaining data about Americans. This raises a variety of legal and constitutional issues, according to Goitein, particularly if the data can be easily searched on a large scale by agencies like the FBI and DEA for their domestic investigations. Anchukaitis, the ODNI spokesman, declined to say whether ICREACH has been used to aid domestic investigations, and he would not name all of the agencies with access to the data. “Access to information-sharing tools is restricted to users conducting foreign intelligence analysis who have the appropriate training to handle the data,” he said. In the early 1990s, the CIA and the DEA embarked on a secret initiative called Project CRISSCROSS. The agencies built a database system to analyze phone billing records and phone directories, in order to identify links between intelligence targets and other persons of interest. At first, CRISSCROSS was used in Latin America and was “extremely successful” at identifying narcotics-related suspects. It stored only five kinds of metadata on phone calls: date, time, duration, called number, and calling number, according to an NSA memo. An NSA memo noted that PROTON could identify people based on whether they behaved in a “similar manner to a specific target.” The memo also said the system “identifies correspondents in common with two or more targets, identifies potential new phone numbers when a target switches phones, and identifies networks of organizations based on communications within the group.” In July 2006, the NSA estimated that it was storing 149 billion phone records on PROTON. Alexander laid out his vision for what he described as a “communications metadata coalition” that would be led by the NSA. His idea was to build a sophisticated new tool that would grant other federal agencies access to “more than 50 existing NSA/CSS metadata fields contained in trillions of records” and handle “many millions” of new minimized records every day—indicating that a large number of Americans’ communications would be included. Alexander explained in the memo that NSA was already collecting “vast amounts of communications metadata” and was preparing to share some of it on a system called GLOBALREACH with its counterparts in the so-called Five Eyes surveillance alliance: the United Kingdom, Australia, Canada, and New Zealand. 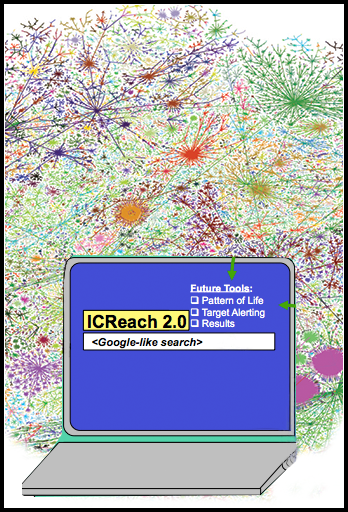 A top-secret PowerPoint presentation from May 2007 illustrated how ICREACH would work—revealing its “Google-like” search interface and showing how the NSA planned to link it to the DEA, DIA, CIA, and the FBI. Each agency would access and input data through a secret data “broker”—a sort of digital letterbox—linked to the central NSA system. ICREACH, according to the presentation, would also receive metadata from the Five Eyes allies. The aim was not necessarily for ICREACH to completely replace CRISSCROSS/PROTON, but rather to complement it. The NSA planned to use the new system to perform more advanced kinds of surveillance—such as “pattern of life analysis,” which involves monitoring who individuals communicate with and the places they visit over a period of several months, in order to observe their habits and predict future behavior. In November 2006, according to the documents, the Director of National Intelligence approved the proposal. ICREACH was rolled out as a test program by late 2007. It’s not clear when it became fully operational, but a September 2010 NSA memo referred to it as the primary tool for sharing data in the intelligence community. “ICREACH has been identified by the Office of the Director of National Intelligence as the U.S. Intelligence Community’s standard architecture for sharing communications metadata,” the memo states, adding that it provides “telephony metadata events” from the NSA and its Five Eyes partners “to over 1000 analysts across 23 U.S. Intelligence Community agencies.” It does not name all of the 23 agencies, however.